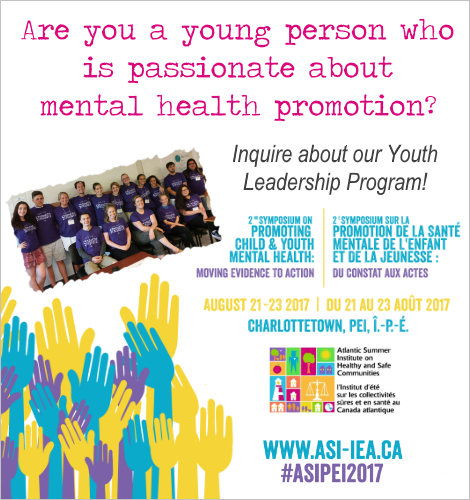 We’re looking for youth who are passionate about mental health promotion! The Youth Leadership Program will build on lessons learned from previous ASI programs and will provide an opportunity for young people to attend and have a voice in shaping the future agenda for children and youth in Atlantic Canada. ASI has learned from previous events how important it is to foster intergenerational learning. During ASI 2017, there will be time for youth to both participate in the full ASI 2017 program and convene separately to develop long lasting connections. ASI 2017 will support at least five youth from each Atlantic province to come together in Charlottetown for this event. Young people between the ages of 18 and 25 who are affiliated with a community group and have experience or are interested in being an advocate or leader are encouraged to apply. Submit an application on our website. Apply by June 30.